A cancer cell under the microscope: The STED image (left) has a background of low resolution. 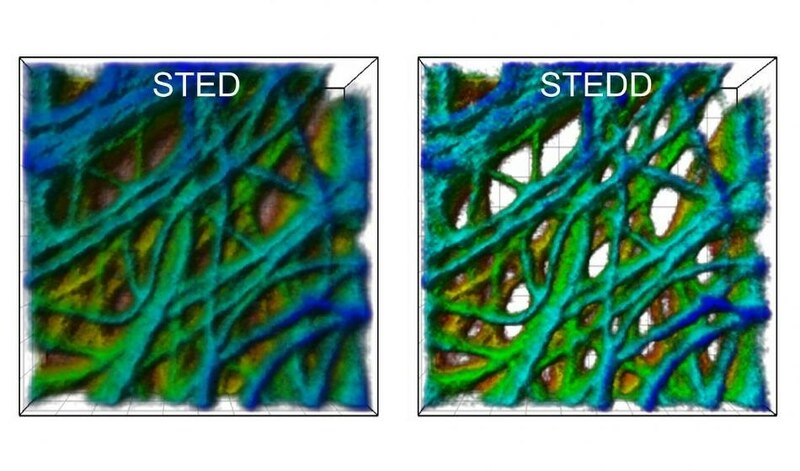 In the STEDD image (right), background suppression results in much better visible structures. CREDIT: APH/KIT. A new fluorescence microscopy technique known as Stimulation Emission Double Depletion (STEDD) nanoscopy, which is a further development of the Simulated Emission Depletion (STED) method, has been developed by researchers from the Karlsruhe Institute of Technology (KIT). Using STEDD, the highest resolution images with suppressed background can be produced. The enhanced image quality provided by this technique is highly beneficial for investigating three-dimensional, densely arranged subcellular structures. There is a wide range of applications for optical microscopy in the field of life sciences. In addition to other uses, it is used for minimally invasive examination of living cells. However, resolution of conventional light microscopy is restricted to half the wavelength of light (about 200 nm) so that the finest cellular structures in the image are blurred. In order to overcome the diffraction limit and to produce highest resolution images, a number of nanoscopy techniques have been developed recently. The Nobel Prize in Chemistry for the year 2014 was awarded to Stefan W. Hell, Eric Betzig, and William Moerner for their nanoscopy techniques in 2014. Currently, researchers from the Karlsruhe Institute of Technology (KIT) have perfected the STED nanoscopy technique originally developed by Hell. They achieved this by modifying image acquisition so that the background is efficiently suppressed. As a result, the enhanced image quality is specifically beneficial to carry out quantitative data analysis of three-dimensional, densely arranged molecules and cell structures. A description of the STEDD developed by the team headed by Professor Gerd Ulrich Nienhaus from KIT’s Institute of Applied Physics (APH) and Institute of Nanotechnology (INT) has been presented in the journal Nature Photonics. Generally, in the fluorescence microscopy, a strongly focused light beam is applied to scan the to-be-analyzed sample in order to make the dye molecules emit fluorescence light. In order to build up the image, the light quanta are registered pixel by pixel. In the case of STED nanoscopy, a so-called STED beam is overlapped on the excitation beam used for scanning. The light intensity of the STED beam is positioned around the excitation beam, and in the center, its intensity is zero. Additionally, the STED beam is shifted toward higher wavelengths is carried out. Stimulated emission, a physical effect first described by Albert Einstein more than a century ago, is used by the STED beam to switch off fluorescent excitation at all places except at center where the intensity of the STED beam is zero. This confines the excitation and generating a sharper light spot for scanning. However, there is always a low resolution background in the high-resolution STED image. This is caused by incomplete stimulated depletion as well as fluorescence excitation by the STED beam by its own nature. The research team headed by Gerd Ulrich Nienhaus has now extended the STED method by overlapping another STED beam. Here, the STED beam is followed by the STED2 beam with a specific time delay, thereby eliminating the useful signal at the center so that only background excitation exists. The STED method is based on recording two images. Photons registered prior to and after the arrival of the STED2 beam contribute to the first and second image, respectively. The second image including only the background is subtracted pixel by pixel from the first image containing the useful signal plus background. They did this by employing a particular weight factor. The outcome of their technique is a highest resolution, background-free image.